Sacramento, CA: Slamming the Trump administration’s repudiation of science, today the 9th Circuit Court of Appeals ordered the U.S. Environmental Protection Agency to adopt a nationwide ban of the brain-harming pesticide chlorpyrifos, which is widely used on California fields. The court supported the findings of EPA scientists, ruling that the EPA must act to protect the health of children from residues on food, contaminated water and drift into homes in agricultural communities. With science and the courts on their side, California farmworker community leaders called on state officials to immediately protect residents by suspending chlorpyrifos use in California. The court’s ruling comes sixteen months after disgraced former Trump EPA Administrator Scott Pruitt refused to ban chlorpyrifos, defying his own scientists’ findings that any use of chlorpyrifos on food crops results in unacceptable exposure to children and pregnant women, including up to 14,000 percent higher than levels considered safe for children ages 1-2 years old. In fact, the U.S. EPA has known for years the damage that exposure to chlorpyrifos could cause, effectively banning the pesticide for all residential use in 2001 because of harm to children. Yet for decades, federal and California regulatory agencies have allowed children in farmworker communities to disproportionately bear the brunt of exposure through residues on produce, water contamination and exposure from drift. Last week, scientists from the California Department of Pesticide Regulation (DPR) concluded their own study, agreeing that current chlorpyrifos use on food crops puts children at significant health risk from each of these exposure routes: food residues, which linger on produce despite washing and peeling; from contaminated water sources; and from pesticide drift half a mile away from applications. 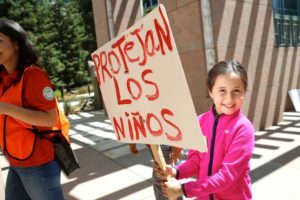 Yet to date, DPR has refused to take any immediate action to protect California children and families. Last year DPR instituted a review of chlorpyrifos to determine whether it meets the criteria of a Toxic Air Contaminant (TAC). Just last week the independent body of scientists charged with making that determination concluded that it is indeed a TAC, but none of these conclusions or studies have resulted in DPR taking any concrete steps to ensure more children aren’t exposed. In addition to causing irreversible brain damage, chlorpyrifos has been linked to a number of other permanent and serious health harms in children, including the increased likelihood of developing autism, ADHD, and worsening or triggering asthma. California uses more chlorpyrifos than any other state in the nation, with more than 900,000 pounds used in 2016, on about 80 crops, including citrus, nuts, apples, broccoli, and dozens of other crops. Every crop that chlorpyrifos is used on in California is also grown organically in the state.